What is it about cities that attracts people from far and wide regions? The rural economy is sludged and people are looking to make money on the go. To reap the benefits of the growing economy, there is no better time and place one could find themselves than in Mumbai or Pune! The Maharashtra Government is doing all it can to make Housing affordable and convenient in order to match with the growing population. One such measure is the Leave And License Agreement. This is a radical step in the lousy history of Rental Agreements that make up for the rest of India. There exists a minor difference in the kind of terms used for a Leave and License Agreement, as opposed to a Tenancy Agreement. As mentioned above, a Licensor can be loosely translated to Landlord and a Licensee to a Tenant. The reason behind the usage of the term ‘License’ is hence obvious, as the process involves the owner of the property giving a ‘license to stay’ for a pre-decided duration of time. While a Tenancy Agreement gives complete possession of the property to the Tenant, a Leave and License Agreement merely gives the Licensee a ‘permission’ to stay. This difference can amount a lot as it allows lesser freedom for the Tenant by substantially reducing the Tenant’s advantage in terms of dictating clauses (alteration of the property, revocation of Leave and License Agreement, possession of the property and eviction of the property). Why Leave And License Agreement? What makes a Leave and License Agreement better than a Tenancy Agreement? The foremost reason which you may have guessed already – no prolonged appointments with lawyers or clearing of doubts in long phone calls. Or being held up in a queue in a boring Sub-registrar Office, staring at mounting frustration on everyone’s face! 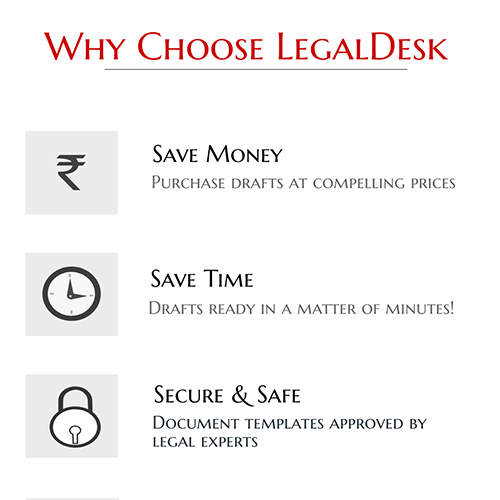 LegalDesk is one place which turns all these hassles into fairy dust! Sit at your desk and edit the clauses to your whims and let us know. Once the Stamp Duty charges are paid, wait for us to ring your doorbell. After we have procured your thumb impression and photograph, your e-registration is as good as done! A Leave and License Agreement is notorious for being convenient to the landlord against the advantages it offers to the tenant. However, equipped with the right content of clauses, both can turn the tide to each other’s convenience. We hope with the help of aforementioned knowledge, it will help each of you draft the right agreement with less or no friction! The burden of Registration of the Leave and License Agreement rests on the Licensor (Landlord) without which he/she is liable to pay fine amounting to ₹ 5000/- and in some cases the Landlord may be punished with imprisonment upto three months. Though the burden of ensuring that the the Agreement is registered rests solely on the Licensor, it is the Licensee’ (Resident) responsibility to incur Stamp Duty and e-Registration charges. To successfully draft a Leave and License Agreement, the necessity of an Aadhaar Account is absolute. Since the whole process of creating the Agreement is digitized, including e-Registration the signing of the document and the thumb impression has to be done through your Aadhaar account. When one links their Aadhaar account at the time of registration, both the thumb impression and their signature is automatically updated. A Tenant cannot revoke an agreement unless it is explicitly mentioned so in one of the clauses. The Licenser can issue a notice to the Licensee expressing his desire to have the Licensor evicted. The period prior to which the notice is to be issued should be agreed upon in the agreement. For registration of your Leave and License Agreement, a Thumb scanner, a biometric device and a web camera is required, without which one cannot finalise a Leave and License Agreement. One can pay the Stamp Duty at the e-registration portal of the Maharashtra Government. Also, you choose to create your Leave and License Agreement through us, for we pay the stamp duty and ensure your agreement is registered. You can calculate both the Stamp Duty charges and Registration charges from our Stamp Duty calculator. The Period of stay that the Licensor grants to the Licensee. Monthly rent to be paid and the Rental Deposit is to be decided upon. Also the licenser should notice the period until which the the rent stays constant and with the consent of Licensee agree upon the periodical increase of monthly rent. Maintenance charges – these include the charges applied for house security, garbage disposal and parking. Inspection – It specifies the period before which a Licenser is supposed to issue a notice for inspection of the premises. Cancellation of the Agreement – The time period until which the agreement stays valid. Possession of the Property – The Licensee should agree to immediately vacate the premises with all his goods at the termination of his/her agreement. Make Your Leave And License Agreement Online! If you are through checklisting the above points, then you are more than prepared to draft your own agreement. Once the Licensee has agreed to the amount of Security Deposit and monthly rent that is to be paid, then leave the rest to us! The information age we live in has made the procedure of procuring legal documents easy as pie – so far as to not require a manual signature! So, click the button below and start drafting your Leave and License Agreement now! We dearly wish you have a pleasant moving-in experience!